These are my favorite items to stock in the pantry and fridge so you can make creative meals on the fly. They can be absolute game-changers when it comes to spicing up leftovers or rounding out a meal. Each list is very roughly in order of frequency of use in my kitchen. * If unopened, can be stored in the pantry. These tools are what I use on a weekly if not daily basis to prepare meals. A powerfully blender for making nut milks, smoothies, lattes, soups, nut butters, marinades and more! (Photo from Vitamix). A large round dutch oven is perfect for slow-cooking, braising and roasting. I use this ALL THE TIME. 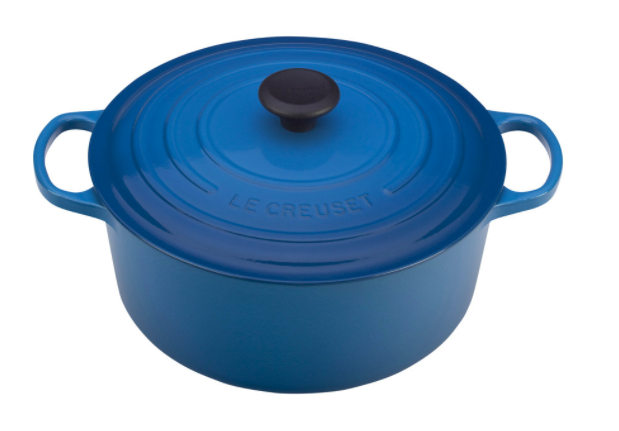 (Photo from Le Creuset). Prepares rice and quinoa beautifully every time. Also keeps rice warm for hours so you don't have to worry about timing. (Photo from William & Sonoma). Chop, slice and dice! These tools are indispensable to both the home cook and professional chef. A 3-cup food processor for chopping and grinding small portions. I use this for making baby food, pestos, and pastes. (Photo from Amazon). Weck, Le Parfait, and Snapware glass containers are my favorite for food storage. I think the less your food comes into contact with plastic the better.